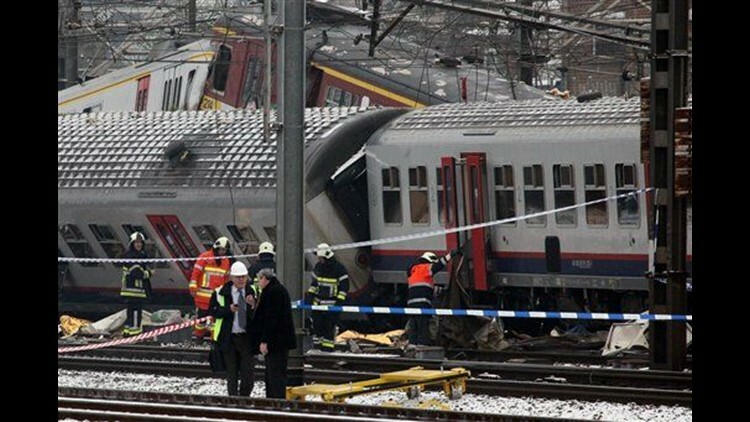 BRUSSELS (AP) — A commuter train ran a stop light during morning rush hour and collided head-on with another train in a Brussels suburb Monday, killing at least 18 people and injuring 55 in Belgium's deadliest train wreck in decades, officials said. The trains collided in light snow just outside of the station at Buizingen around 8:30 a.m. (0730GMT). It appeared to be the country's worst train wreck since 1954, when a crash near Leuven killed 20 German soccer fans and seriously injured 40 others. In March 28, 2001, eight people died when a crowded train plowed into an empty train driving on the wrong tracks. "There were people lying on the ground next to the train, so I grabbed some blankets and ran into the back garden," he said. "But I but couldn't climb over the concrete wall, so I just threw the blankets to the rescuers who were already gathering." Belgian Prime Minister Yves Leterme canceled a trip to Kosovo, turning around his plane minutes after landing at Pristina's main airport, the Kosovo prime minister's office said. "No (Thalys) train is moving for the moment ... it's very hard to know today when services will resume," she said. "It appears this was a very severe accident." Associated Press writers Jamey Keaten in Paris, Jan Olsen in Copenhagen and Nebi Qena in Pristina, Kosovo contributed to this report.